One of the greatest things about traveling in the South is the unexpected magic you can find once you get off the freeways. Sometimes you don’t even have to get far off that path. As the Grateful Dead sang far more eloquently – “once in a while you can get shown the light; in the strangest of places if you look at it right”. I spent the week of May 19 – 22 on an extended business trip; with stops in Charlotte NC, Kennesaw GA, and Cheraw SC. On the final leg home; I took a break at a small truck stop in Rockingham NC, just off US-74. As I got out of the car, I could hear the sweet sound of bluegrass coming from across the parking lot. After taking care of business and stretching my legs a bit; I had to investigate further. 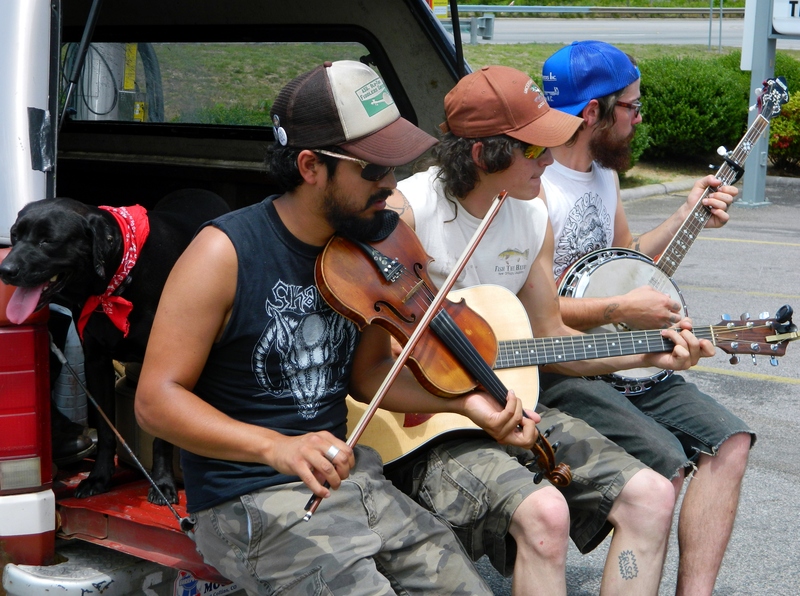 And there I met the “Hashbrown Belly Boys”, playing for gas money to get to a gig in Wilmington NC. Clicking any photo get’s you a higher resolution version – see copyright and sharing notice below. “Hashbrown Belly Boys” is not only one of the coolest band names I’ve encountered in quite some time; but these three guys back it up with talent! As I approached, they were playing one of the best renditions of an old Carter Family song -“Ain’t Gonna Work Tomorrow” – that I’ve ever heard. Between songs, I had the opportunity to introduce myself to the band and get a bit of their story. 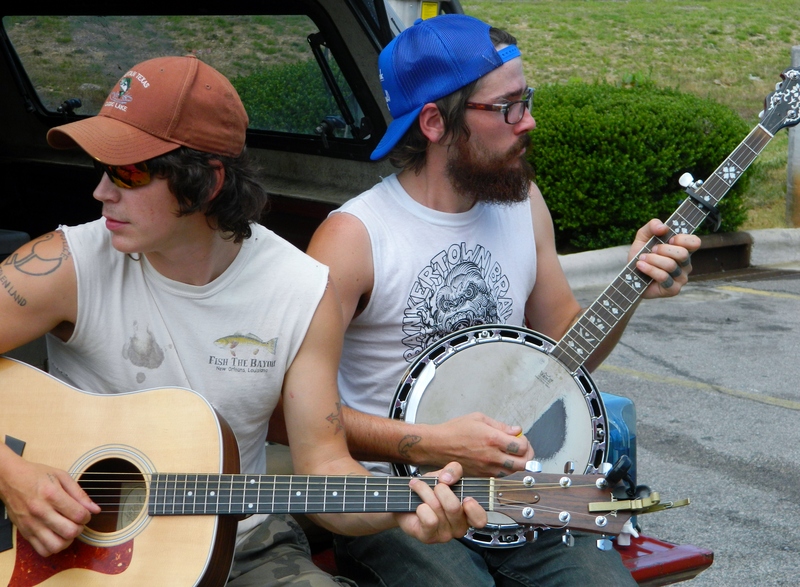 The Hash Brown Belly Boys are based in Charlotte NC, and play clubs there frequently. 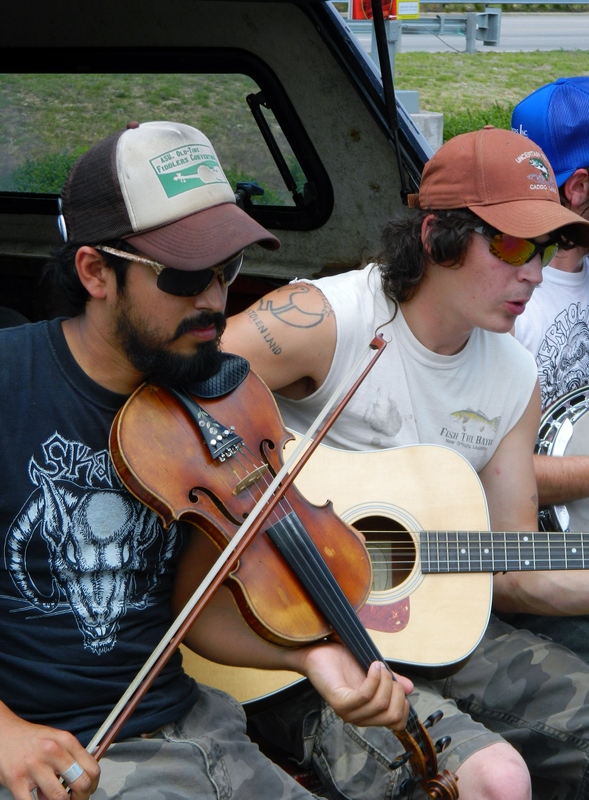 They also get gigs around the area, and were on their way to a show in Wilmington NC on Friday night. They hoped to arrive in time to do some fishing before the show. 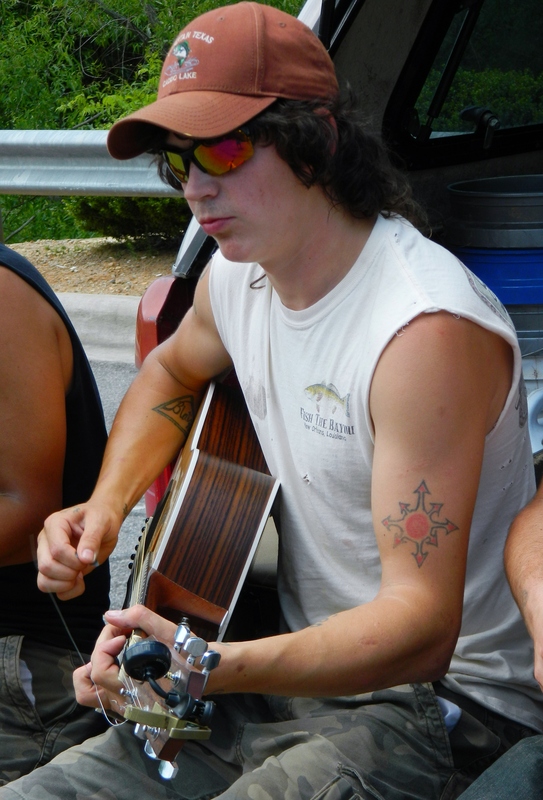 Then they would be back in Charlotte playing an outdoor BBQ event at Tommy’s Pub on Sunday afternoon. Wish I could make that show! At least for this trip; they were accompanied by a very well behaved Labrador named “Ballyhoo”. I’m not sure if Ballyhoo is the band’s mascot or road manager – but I think she’d do well in either role. Granted my introduction to the Hashbrown Belly Boys was short but sweet, I would describe their “style” as traditional bluegrass, tempered by a bit of folk sensibility. Instrumental work is seamless; with no instrument overpowering any other. Vocals are not the stereotypical bluegrass “high lonesome sound”; but sort of reminded me of early harmonies by Poco and the Eagles. Again, seamless and their voices work well together. Of course, they very well may incorporate other styles during more formal shows. After enjoying their playing for a few more minutes, it was time for me to get back on the road. I thanked them for permission to share the story of our encounter, made a small donation to their gas fund, and wished them well on their journey. If you get a chance to see the Hashbrown Belly Boys – don’t miss it! 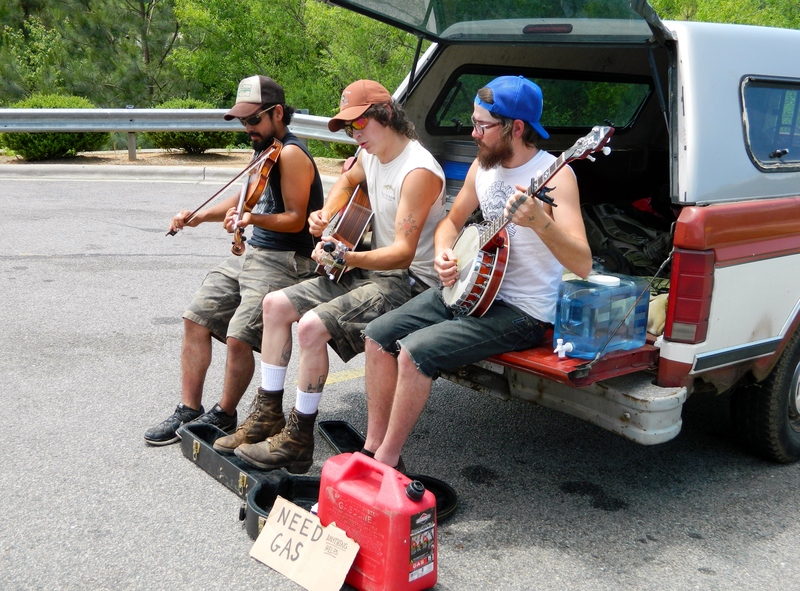 Something tells me this group of talented young men will not need to busk for gas money for long. Listen to the Hashbrowns here! Thanks for dropping by! Check in often, as you never know what we’ve been up to! Copyright Notice – unless otherwise credited, all text and photos are © Picture The South, 2013 – 2016. Sharing is permitted and encouraged, but for non-commercial use only. Please give credit to source! If you would like to use anything commercially, please contact us at picturethesouth@gmail.com to work something out. Content of all external links is copyright the respective owners. Americana, Bluegrass, folk, Music. Bookmark.